This post was provided by Samsung. Samsung Electronics Cloud Operation Group (SECOG) unveiled these three portals at Samsung Developer Conference 2017 and 2018. 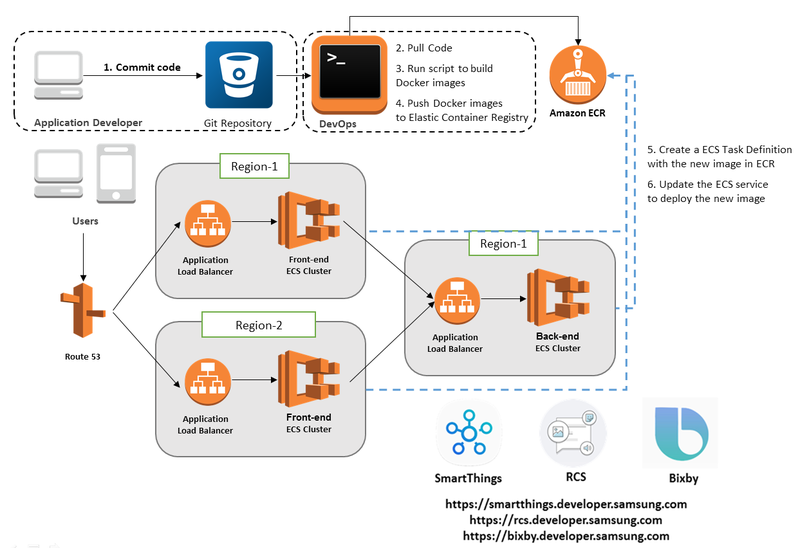 Samsung developed the SmartThings portal on ECS and had an overall good experience using it. We found that ECS provided the appropriate level of abstraction while also offering control of their underlying instances. However, when we learned about AWS Fargate at re:Invent 2017, we wanted to try it out. Being an Amazon ECS customer, there was a lot to like about Fargate. It provided significant operational efficiency while also eliminating the need to manage servers and clusters, meaning we could just focus on running containers to release new features. In 2018, our engineering team began migrating all of our systems to Fargate. Because Fargate exposed the same APIs and endpoints that ECS did, the migration experience was extremely smooth and we immediately experienced improvements in operational efficiency. Before Fargate, Samsung typically had administrators and operators dedicated to managing their web services for the portal. However, as we migrated to Fargate, we were able to easily eliminate the need for an administrator, saving operational cost while improving development efficiency. Now, our operations and administration teams are focused more on elaborate logging and monitoring activities, further improving overall service reliability, security, and performance. The Samsung developer portal is built using a microservice based architecture, and provides technical documents, API Docs, and support channels to our customers. To serve these features, the portal requires frequent updates to a number of different Fargate services. Technical writers who are interested in publishing new content every day initiate these updates. To meet these business requirements, Samsung Electronics Cloud Operation Group (SECOG) and Technology Partner (TecAce) researched services that were agile and efficient and could be run with minimal operational overhead. When they learned about Fargate, they were interested in doing a proof of concept and based on its result, were convinced that Fargate could meet their needs. Security: the Service Ops should have the ability to control every Security factor. Scalability: the Service focuses on Samsung developers who are using Samsung products in public. The Service therefore should be capable of handling traffic surges. Easy to deploy: technical documents are easily pushed to the live environment giving technical writers the ability to easily make edits. Controllability: The Service should be able to control container options such as port mapping, memory size, etc. As we dived deeper into AWS Fargate, SECOG and Infosec teams were satisfied that Fargate could deliver on all these requirements. SECOG and TecAce decided to use AWS Fargate and Amazon Elastic Container Registry (ECR) service to meet the key requirements of the developer portal. The System Architecture is very simple. When we release new features or update documents, we upload new container images to ECR then we publish our code to production. Each business application is designed with the combination of Application Load Balancer (ALB), Fargate, and Route 53. After using Fargate, Samsung’s business owners were extremely satisfied with the choice. The Samsung Developers is operated and configured with multiple teams, which are globally distributed with development, operations, and QA roles, and responsibilities. Each team needs to deploy an individual environment for test. Before Fargate, we needed considerable engineers and developers bandwidth to operate web services infrastructure. However, Fargate simplified this process. Each team only needs to create a new container images and deploy to ECR. The image is then deployed to the test environment on Fargate. With this process, we were able to greatly reduce the time our developers and operators spent managing and configuring this infrastructure. With Fargate, we are able to deploy more often to production and teams are able to handle additional Samsung products within the Samsung Developers. Additionally, we don’t have to worry about deploying and creating new images. We simply create a new revision, setting the container’s memory and port. Then, we select our Fargate cluster after determining the commute capacity needed. The compute capacity of the Fargate services can be easily scaled out using Autoscaling. Therefore, all deployment tasks only take a few minutes to serve. Additionally, there is no cluster managed by a system administrator or operator, and there is no EC2 instance and no docker swarm to maintain the services. This ensures that we can focus on the features of Samsung Developers and improve end-customer experiences. Currently, when an environment is deployed and served at Samsung Developers, Samsung monitors the health with alarms based on Amazon CloudWatch metrics. In addition, we have easily achieved the required availability and the reliability from our portal while reducing monthly costs by approximately 44.5% (compute cost only). Because of Samsung’s experience with Fargate, we have decided to migrate additional services from ECS to Fargate. Overall our tems have a great experience working with Fargate. The level of automation Fargate provides helps us move faster while also helping us become more economical with our developerment and operations resource. We felt that getting started with Fargate can take some time, however once the environment is set up, we were able to achive high levels of agiligty and scalablility with Fargate. Samsung is a South Korean multinational conglomerate headquartered in Samsung Town, Seoul. It comprises numerous affiliated businesses,most of them united under the Samsung brand, and is the largest South Korean business conglomerate.